In my quest to make cooking Christmas dinner less stressful, I have created this Easy Christmas Vegetable Traybake. 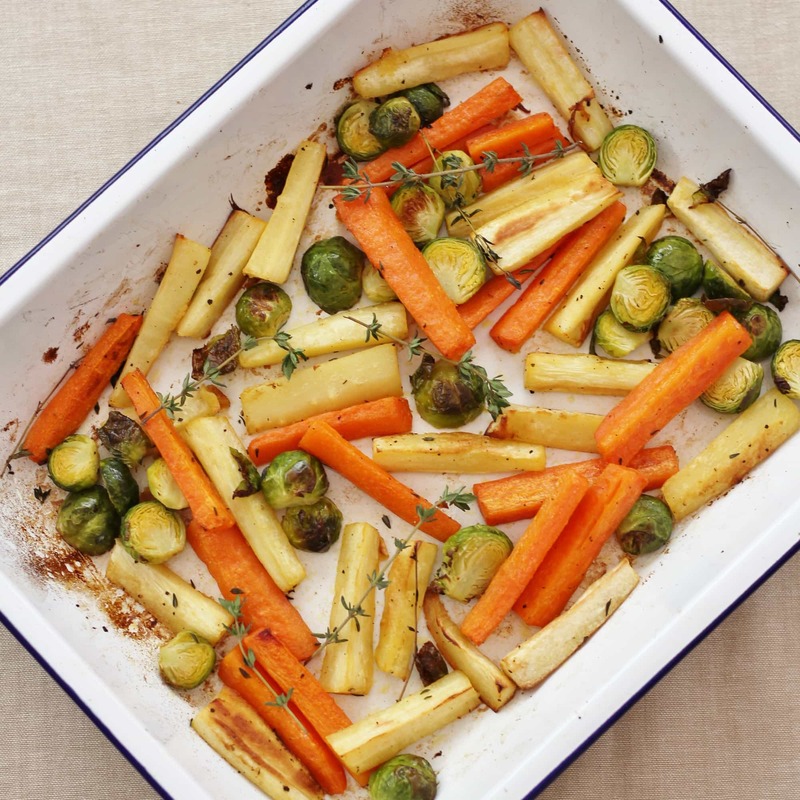 Roasting the parsnips, carrots and sprouts all together in one tray means you can relax and have a glass of bubbly instead of juggling pots and pans like a mad thing this Christmas. Cooking Christmas dinner can be extremely stressful, can’t it? Often it is the turkey that causes the stress – and if that’s the issue for you, do check out this post I wrote last year: 20 Simple Tips To Take The Stress Out Of Cooking Your Christmas Turkey. Or sometimes it’s just juggling so many different dishes. If that is what drives you a bit bonkers, I have written a helpful Christmas Dinner Time Plan and Shopping List to help you juggle everything. But for me the thing I often find most stressful is the veg. The turkey is resting happily, the potatoes are merrily doing their thing in the oven and just when it would be nice to have a sit down and a glass of something bubbly, there I am stressing about the sprouts. It’s partly my fault, of course. I always plan to make far too many different ones and then it’s a mad juggling act trying to find space for everything on the hob (in amidst the bread sauce, the gravy and the cranberry sauce) and desperately trying to ensure they all cook at the same time and none of them go cold. Then of course inevitably it’s the turkey and roasties that are devoured and the veggies remain hardly touched as everyone has always stuffed themselves silly with nibbles earlier. So this year I’m going to simplify what I do dramatically and make my life considerably easy peasier…by making my Easy Christmas Vegetable Traybake! 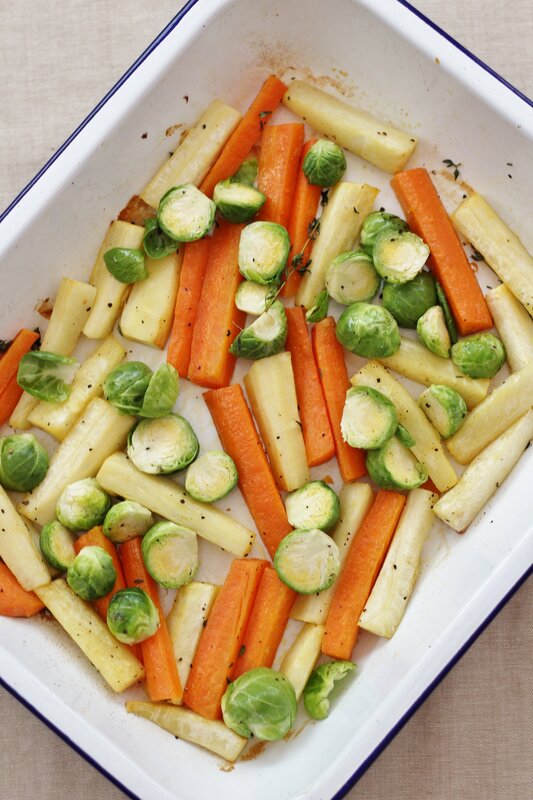 I’ve decided that the veg I really care about at Christmas are roast parsnips, sprouts and carrots. And instead of juggling pans on the hob, I’m going to roast all of my veg together in one tray. 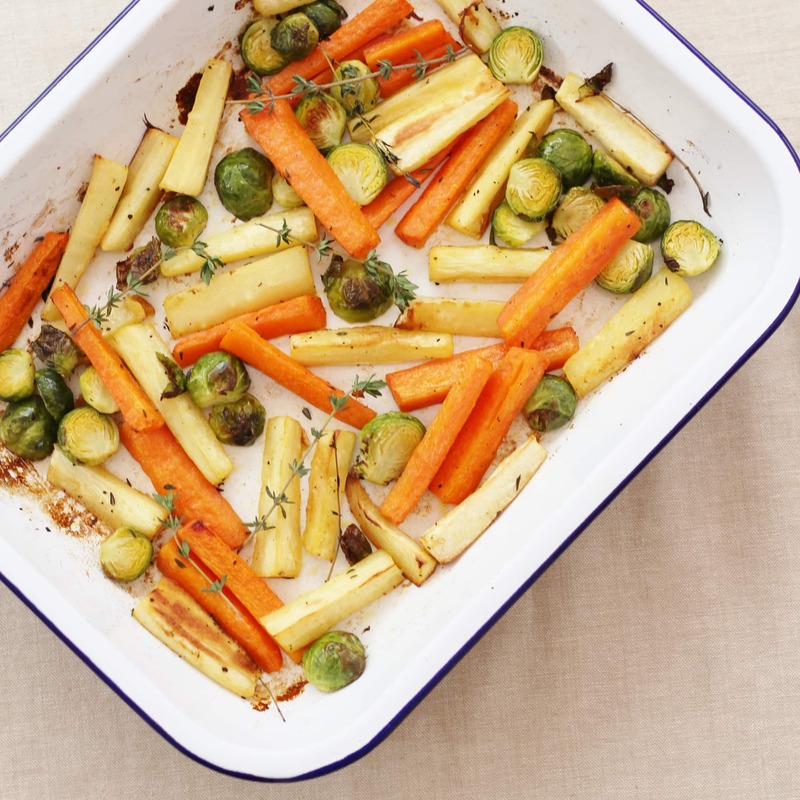 Roast parsnips are a firm Christmas favourite, of course, and roast carrots are lovely too, but have you tried roast sprouts yet? They are amazing! Just chop them in half and chuck then in the tray for the last 15 minutes and they will be perfectly cooked, plus roasting gives sprouts a gorgeous nutty caramelised taste that is so much nicer than boiled or steamed sprouts. So then on Christmas Day these veggies can be popped in the oven at the same time as the roast potatoes and at the same temperature, whilst the turkey is resting and I can relax and have that glass of bubbly, instead of rushing round like a mad thing before lunch. Bliss! Being so simple to make (not to mention CHEAP! 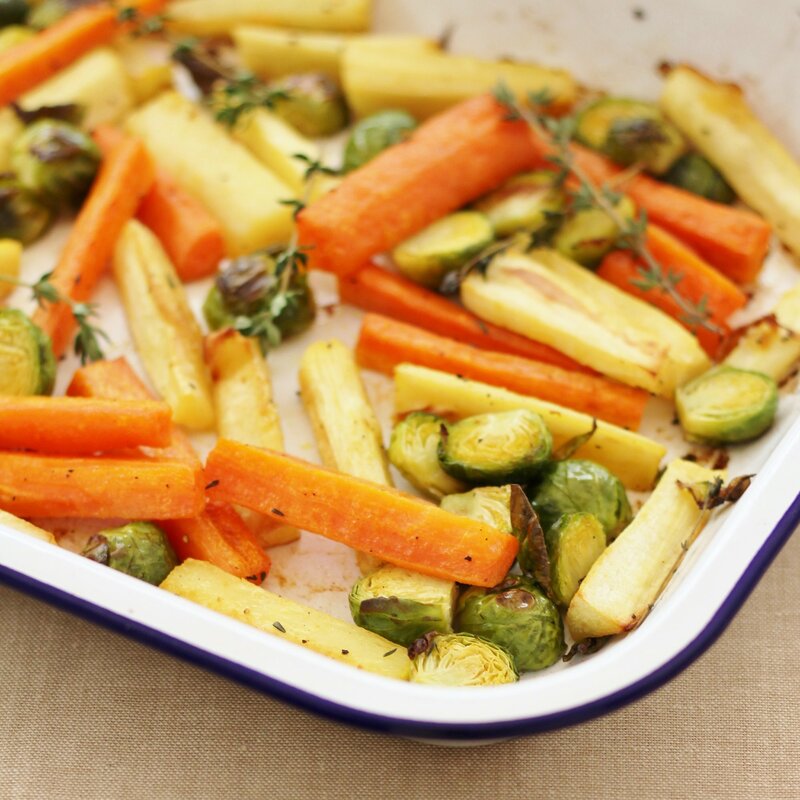 ), these easy roast vegetables don’t have to be reserved for Christmas day. They would be fabulous with a Sunday roast or even midweek for a bit of a pre-Christmas treat. They would go brilliantly with my Gin Brined Chicken or Easy Mulled Wine Christmas Ham, for example. Or to make a fabulously easy vegetarian Christmas Dinner why not pair them with my Cranberry, Feta and Quinoa Stuffed Butternut Squash. Of course if you wanted to go the whole hog and make your Christmas Dinner really easy peasy, you could make my Easy Peasy Christmas Turkey Traybake: an entire roast turkey dinner for 4 in one tray – yes really! Pre-heat your oven to 220C / 200C fan / gas mark 7 / 425F. 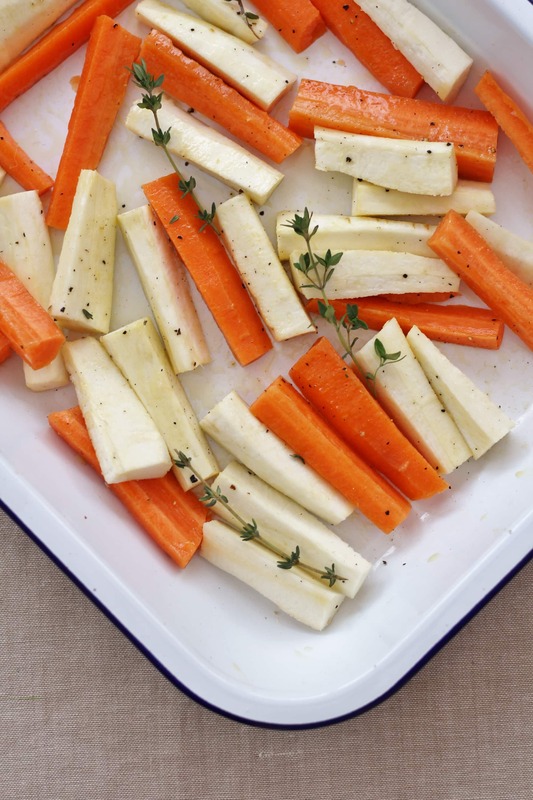 Peel and chop the parsnips and carrots into batons and place in a baking tray. Drizzle with a couple of tablespoons of olive oil and sprinkle over salt, pepper and whichever herbs you are using. Mix everything together to ensure the veggies are evenly coated (I use my hands but you can use a spoon if you prefer) and put the baking tray into the oven. Roast for 30 minutes. After the 30 minutes, remove the vegetables from the oven and add the sprouts. Toss everything together again (this time definitely use a spoon! ), ensuring none of the carrots are parsnips are sticking, and return the baking tray to the oven for a further 15 minutes. Serve scattered with more herbs. 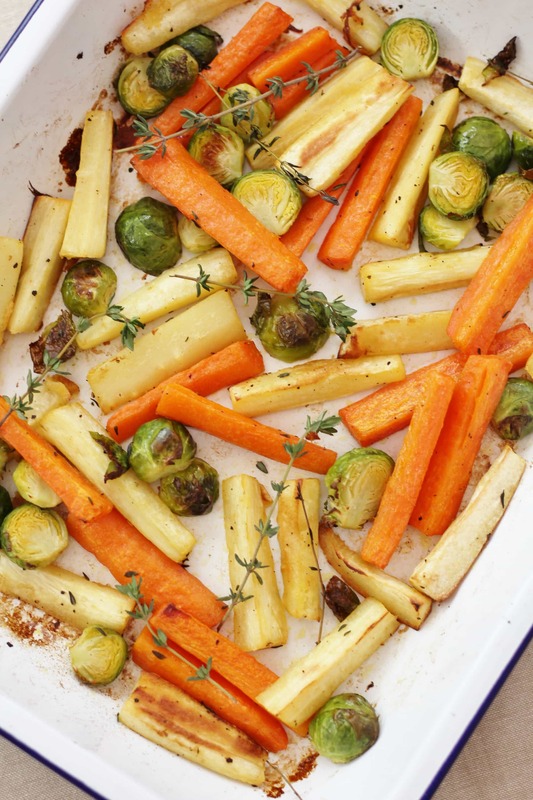 Roasted veggies are the best, aren’t they? I adore them. Plus, I love that you can just bung ’em in the oven, and forget about them until they’re done. Do you ever roast beetroot too? It’s wonderful! What a fab idea Eb. I love roasted carrot and parsnips (and of course potatoes!) but have never tried roasting sprouts. I’ll definitely have to give that a go. We had an early Christmas dinner with my parents yesterday (they’re with my brother this year) and they chose to buy a couple of mixed bags of prepared veg from M&S which was just steamed on the hob using just one pan. I’ll have to suggest this to mum because it’s a great idea. I’m planning on roasting my Christmas veg too, for starters it’s easier, and I always thing roasted veg has far more flavour and texture than boiled. I’m going to pop my sprouts in the Turkey tray though as I love the flavour it gives them. Oh yes the vegetables are definately the most stressful part of the Christmas dinner as it all comes down to timings. Luckily for me I have 6 gas rings which helps but even so . I love this solution nice and easy peasy and I love roasted vegetables too.